One of our most unique and useful features is the ability to create your own applications right from the BudgetTracker site. When creating a new application, we present you with a form where you can specify the fields you would like your application to have such as dates, titles, amounts, or even custom calculations. Once your application is completed, the application becomes available for all users to take advantage while the data entry remains private. 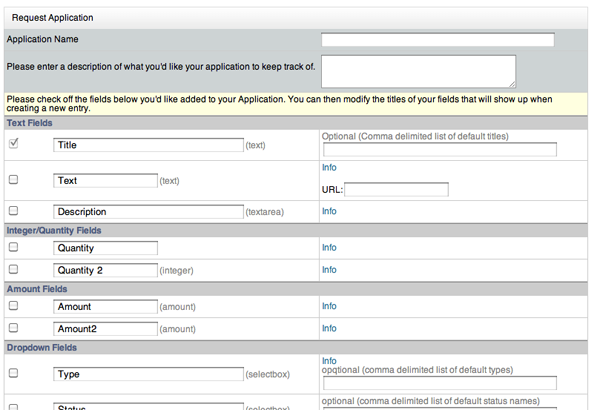 Create your own applications tailored to your needs. Use applications that other users have created. Allows you to track anything you can think of. Ties in directly with your finances so that entering a transaction will automatically mark the item as paid. Ties in to the My Calendar so you can get a visual representation of the data you are entering into the system.